2hD co-founder Alina Hughes is leaving the practice after 12 years to pursue new creative directions. 2hD was started in 2003 by Alina, Tom Hughes and Thibaut Devulder when they collaborated on the competition-winning Sky Vault landmark design. Since then the practice has evolved with the three founders collaborating on a series of successful projects. Alina in particular has been instrumental in networking and putting the practice in front of new audiences through competition entries and her role as Nottingham and Derby Society of Architects President from 2009 to 2012. Alina has built up her role in architectural education, including the setting up of a new Architecture course at Nottingham Trent University (now finishing its 9th year), whilst retaining her role as Design Director at 2hD. “Alina has had a huge contribution to 2hD’s trajectory and development” said Tom Hughes. “Her passion and intensity has remained undaunted and she has worked to bring a small startup practice recognition on the local, national and international stage. I’m sure Alina will be keeping a watching brief as we move on — and we look forward to collaborating with her in the future." Co-founder Thibaut Devulder said "Alina has ensured that we have continued to be principled and deeply thoughtful in our design work, and has embedded this approach so that it will endure for the future. I wish Alina every success in her new ventures." Tom and Alina accepted the award from Ruth Reid, ex President of the RIBA and were joined at the ceremony by Nick Crosbie of Inflate, who did the specialist design, fabrication and erection of the pavilion. 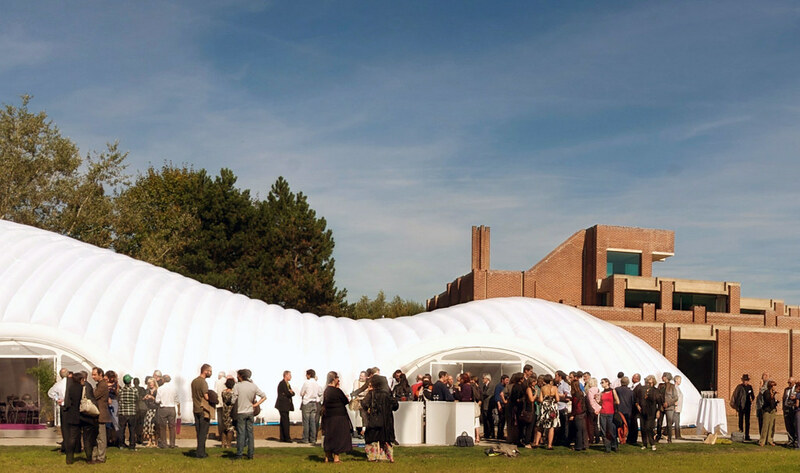 The Royal Institute of British Architects (RIBA) have announced the shortlisted projects for the 2011 RIBA East Midlands Award for Architecture, celebrating the finest examples of architectural excellence in the region. 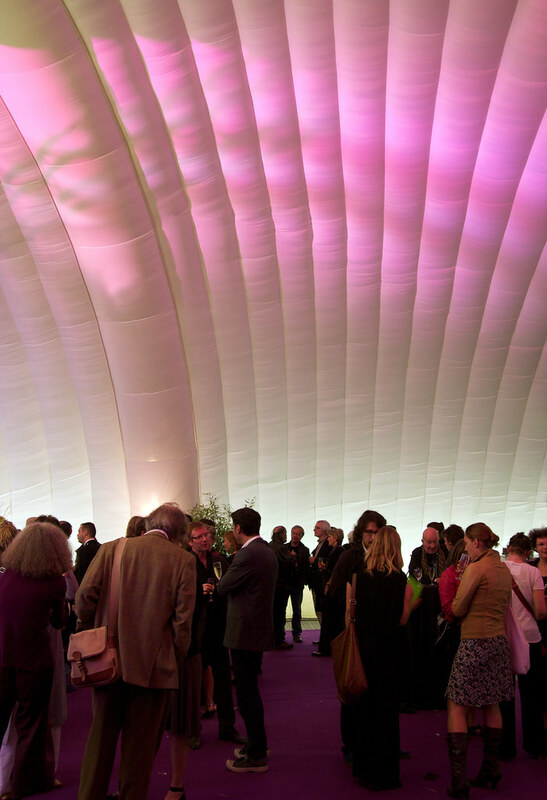 French Culture and Communications Minister, Frédéric Mitterrand, described this inflatable events space designed by UK architects 2hD as “Very beautiful” during an official tour yesterday. The compliment came as the Minister toured the newly reopened Museum of Modern Art in Lille, France. He diverted from his official route to view the inflatable structure, which is a focal point for celebrations of the Museum’s reopening after four years of refurbishment and extension. 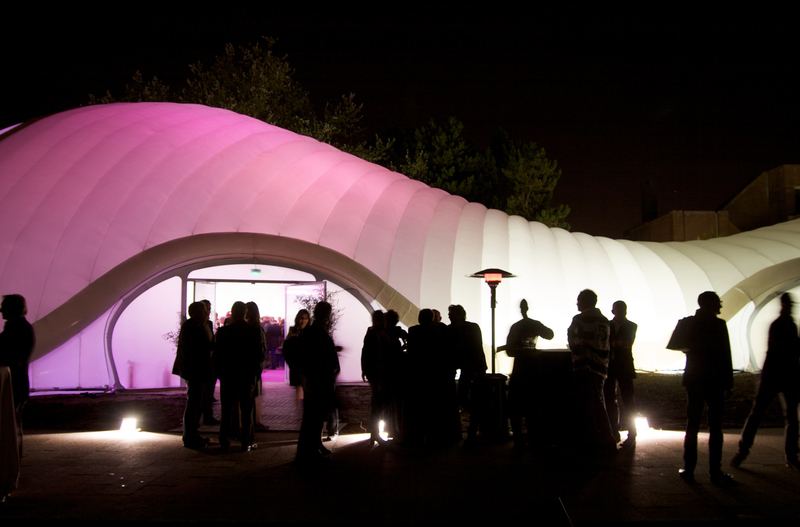 The pavilion later wowed guests at the official opening ceremony with its flowing lines and glowing structure. According to German artist Barbara Gaul, “The fascination with this wonderful pavilion is so great that everyone -- despite the summer weather outside -- wants to be inside it, and all faces are lit up with joy!” “Not only is it functional but also very sensitive and protective” said Simone Few, visitor and wife of jazz musician Bobby Few. Located in the sculpture park at the entrance to the Museum, the events space will be the focal point for a week-long programme of events, including the public opening on 25th-26th September. As well as hosting official speeches, dinners and performances, the space will help to welcome and introduce people to the extended Museum and its impressive collection of Modern art. The events space in context of the sculpture park. The events space with the refurbished museum buildings behind. Events space exterior at night. Events space interior at night.